The history of wind energy extends to 1000 B.C, when sailors applied simple cloth sails to propel their boats using energy from wind. Most of the early civilizations harnessed the power of wind to run windmills and draw water from canals. The wind wheel of the 1st Century AD Greek engineer Heron of Alexandria is the first recorded instance of using wind power to run a machine. The first known systematic application of windmills in industry, to grind corn and pump water was in 7th Century Central Asia. The windmills of those times were made of six to twelve sails covered in reed matting and had long vertical driveshafts and rectangle shaped blades. Traders introduced windmills to Europe from Central Asia by 1180 AD, and many of the Dutch horizontal-axle windmills built at that time still stand. Medieval Windmills underwent considerable technological developments in Holland and England, with the British developing an "automatic control" mechanism to regulate the speed of the windmills. Although windmills found widespread use in the medieval industries, people did not have a way to store the collected energy for later use. Credit goes to Prof. James Blyth of Scotland for generating electricity by using windmills. In 1887, he devised a 33-foot high, cloth-sailed wind turbine that charged accumulators to light his cottage. Blyth was however unable to sell his surplus electricity to his neighbors, for they thought electricity was "the work of the devil!" Meanwhile, American colonists transported windmills to the new world. In 1888, Charles Brush emulated James Blyth and developed the first wind-powered turbine that generated electricity in the United States. Brush’s wind turbine had A 56-foot diameter rotor mounted on a 60-foot tower, and had 144 blades. It could produce just 12 kW of power. Farms across United States installed over six million small windmills of less than one horsepower mechanical output during the early part of the 20th century. Development of an improved wind turbine generator for use in farms outside the electricity distribution lines by Joe Jacobs and Marcellus Jacobs in 1927. Development of the Darrieus wind turbine in 1931. This windmill had a vertical axis that replaced the conventional horizontal-axis, allowing the blades to rotate with wind from any direction without adjustments. The heavy generator and gearbox equipment could rest on the ground, doing away with the need for a tower. Development of large windmills with rotors up to 18 meters in diameter to pump water for the steam railroad trains. The largest wind turbine located at Grandpas Knob, a Vermont hilltop, designed by Palmer Cosslett Putnam and manufactured by Morgan Smith produced 1.25 megawatts in winds of about 30 mph and became famous for feeding electric power to the local utility network for several months during World War II. The popularity of wind energy always depended on the available of electricity and the price of fossil fuels. The Rural Electrification Administration (REA) initiative to bring cheaper and more dependable electricity to rural areas in the 1930s, combined with the decline of fuel prices after World War II led to a rapid decline of windmill usage in the USA. Interest in harnessing energy from renewable sources such as wind received a fillip in the aftermath of the OPEC oil embargo of the 1970s. The subsequent increase in energy prices, the expense of replacing electric pumps and the growing environmental awareness sustained further advancements in windmill technology. NASA, with funding from the National Science Foundation and the United States Department of Energy (DOE) took the lead in advancing technology and developing large commercial wind turbines. The association of NASA and windmills is a watershed in the history of wind energy. NASA’s research enhanced the aerodynamic, structural, and acoustic engineering design capabilities of windmills and incorporated steel tube towers, variable-speed generators, composite blade materials, and partial-span pitch control in windmill technology. These features contributed to many-fold increase in power generating capabilities of individual windmills. NASA’s MOD-2 wind turbine cluster produced a total of 7.5 megawatt of power in 1981 and MOD-5B, the largest single wind turbine operating in the world with a rotor diameter of nearly 100 meters had a rated power of 3.2 megawatts. By 2006, the wind turbines across the US generated 26.6 KWh of electricity, sufficient to power 2.4 million homes. In 2008, Rock Port, Missouri became the first city in the United States to receive its entire power requirements from wind energy. 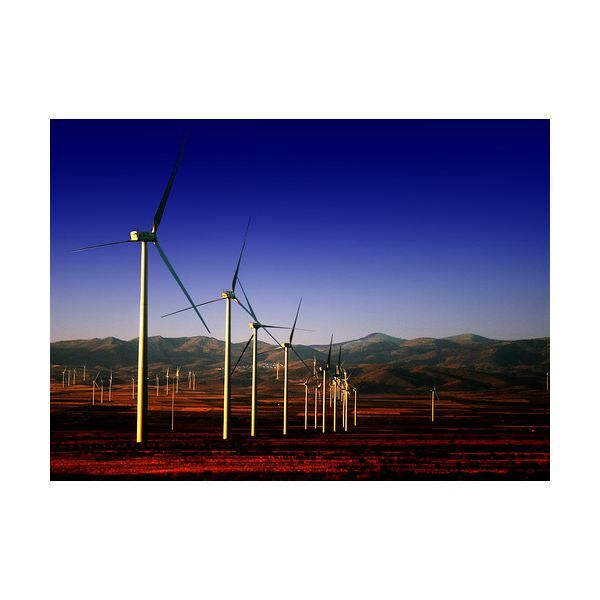 Although the technology to harness wind energy has undergone much improvements, the history of wind energy shows that the popularity of harnessing power from the wind depends primarily on the economics of alternatives such as energy from fossil fuels. Although fossil fuel is still relatively cheap, recent technological developments such as Shawn Frayne’s Windbelt, a non-turbine wind power generator that claims to produce power at 1/10 the price per watt as turbines, combined with rising concerns over energy security, global warming, and fossil fuel depletion have rekindled an interest in renewable energy. The commercial wind power industry enjoys a growth rate of about 30% per year and the industry is still in its growth stage. Sterling, Bruce (January 3, 2009). The Lost History of American Green Technology.